Likes- Being Groomed, loves attention. Dislikes- her ears being touched, injections..
Bess was unable to be ridden much by her past owner as she was very difficult to handle and far too strong. Bess hadn't been broken in properly. She was 7 when we first got her. She was hard to control and she had to have a lot of schooling. Bess is recovering from her broken leg. We hope she will return to work soon. As you can see by the photo Bess has recovered beyond any of our wildest expectations. 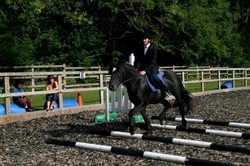 This is her at the beginning of a jumping clinic which she took in her stride. She mainly sticks to jumping on a surface to help protect her leg but she is good for riders of all abilities in walk, trot, canter and jumping.